If you are like me you struggle with cynicism and misanthropy from time to time. People, man, are just the worst. When I get in funks like this I turn to two places: Jesus and Walt Whitman. As I've written about before, Jesus' ministry of table fellowship, of eating with "tax collectors and sinners," always lifts my spirits. I love how Jesus offends religious people by always hanging out with the wrong people. If you went looking for Jesus today and had two places to look, a bar or church on Sunday morning, where would you check first? I know my answer. Whitman, for similar reasons, does the same thing for me. 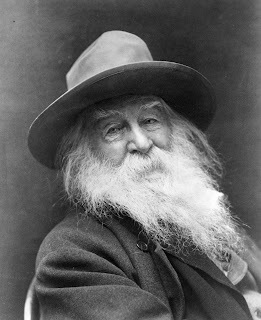 I love how Whitman absorbs and identifies with all of humanity. Male and female, slave and free, saint and sinner, rich and poor. Whitman, to use his words, embraces multitudes. And I want to embrace multitudes. Whitman embodies what the theologian Miroslav Volf calls a "catholic personality," making space within the self to accommodate others. And I think that is often missing in religious people. We fail to make space in our hearts and minds for other people. I love the word "invited"...and the idea of hospitality as an antidote to cynicism. Great poetry, and great theology. Simply gorgeous. I shared this with a friend who has a blog about food and identity who is a Christian - it is amazing how comforted/recognized one feels when one reads or hears or sees the expression of something one feels but has not articulated. I love this. It stands in stark contrast to the mentality that only quantifies the degree to which one agrees (theologically, politically, socially), and measures another's value thereby. Bravo. Nice. So glad I found you. Just received Walt Whitman (1819–1892). Leaves of Grass. 1900 O Me! O Life! from a friend and that prompted me to look up Whitman's theology. and I found your work.